All students sing America in a key that will designate the phase of voice change. For example, playing in the key of F will help identify treble singers. The classifier walks in front of each student, listening as they sing. He/She taps the arm of those whose voice he/she will fist classify. 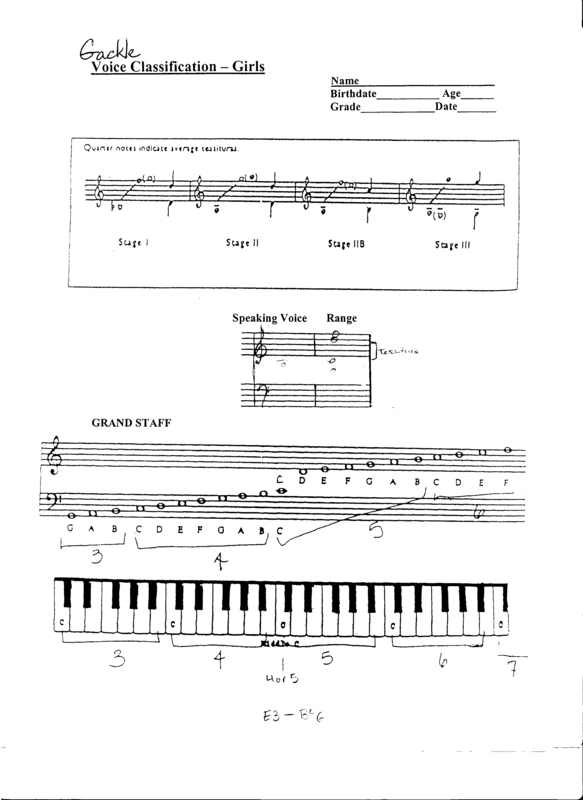 For example, the classifier might tap all students who are easily singing with a nice clear tone in the upper register. These are your unchanged male voices. As the classifier changes the key of America a different voice phase is identified. Each person tapped will be individually classified. On a continuous, supported breath flow have students count backwards from ten. Identify the average spoken pitch and notate the pitch on the classification chart (see spoken pitch). The lowest usable singing pitch is a minor or major third below this pitch (Gackle, 2006). From just above the spoken pitch, vocalize down (SFMRD) on [a]. Listen for when the quality of the voice changes or there is strain. Proceed only to where the voice can go. Notate the lowest singing pitch. You may also want to notate where the timbre changed drastically. Repeat the above vocal-ese ascending from just above the spoken pitch. Notate the highest singing pitch. Tessitura describes the most musically acceptable and comfortable range for a given singer, and sometimes is used to describe the range of a piece of music. Singer crescendos on particular pitches within the range on an [a]. Listen for ease of production, the “best” color, clarity, volume, etc. If the student cannot crescendo on a particular pitch that pitch is probably not in his tessitura. Ask the student to sing America in particular keys (e.g. F, A, D major). Identify and notate where (range of notes) the greatest ease of production, clarity, and volume occur. Singer sings a major scale on [a]. Adolescent female: begin on A or Ab below middle C. For adult female: you may want to start them at Bb below middle C. For male adult: begin at F below middle C, allowing them to continue through their register change. Listen for a timbre change or flip from one particular note to another: notate where this occurs. For the adolescent we are looking for whether there is breathiness, huskiness, clarity and/or resonance in the voice. The quality of voice helps us identify the voice’s developmental phase (stage). 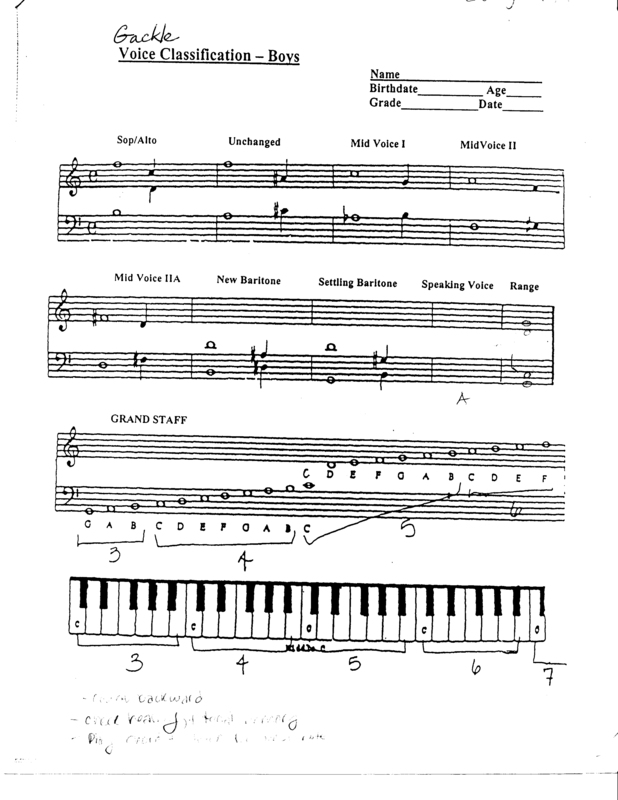 This entry was posted in Teaching Chorus and tagged alto, baritone, bass, choir, choral, chorus, classification, high school, middle school, pasaggio, range, soprano, tenor, tessitura, vocal, voice. Bookmark the permalink.